Wooldridge Creek Winery is located in the heart of the Applegate River Valley in Southern Oregon. The winery and vineyards are located on a rolling hillside overlooking the Applegate River Valley. The first grapevines were planted at Wooldridge Creek in the 1970s. Our vineyard has now expanded to 56 acres planted in twelve varieties: Cabernet Sauvignon, Merlot, Cabernet Franc, Syrah, Chardonnay, Pinot Noir, Viognier, Sangiovese, Zinfandel, Malbec, Petit Verdot and Tempranillo. Owners Ted Warrick, Mary Warrick, Greg Paneitz, and Kara Olmo invite you to stop in for wine tasting and a tour of our family vineyard and winery. You can also visit CrushPad Creamery & Charcuterie while you’re there. 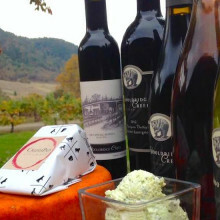 In June 2015, CrushPad Creamery, Oregon’s first joint creamery and winery opened in the Applegate Valley at Wooldridge Creek Winery. In Summer of 2016, the venture expanded into house-made charcuterie items as well. CrushPad Creamery offers cheese from both cow and goat milk, ranging in style from soft and creamy to hard cheeses that are aged for over one year.